A chicken waterer can take many shapes and forms. No matter how it’s done, a chicken needs access to water, every minute of its waking hours. Clean fresh water is important. Containers that can’t spill, are set high enough to prevent droppings and shavings from entering easily, and warming devices to prevent frozen water supplies in winter are easily available. Open buckets or large bowls, cleaned and refilled daily, are an inexpensive way to go, and may work best for some. More complicated watering systems may need plumbing and freeze easily in winter, but work well most of the year. Plastic waterers with a covered tank that automatically refills a tray as water is used, are most common and available at poultry supply stores. Scrubbing these out frequently will prevent excessive bacteria and clogging. When raising chicks, their chicken waterer needs to be low to the floor of the brooder, cage, pen or coop. As they grow the waterer should be raised to help prevent shavings and droppings from filling the tray base. In brooders with lights on 24/7 make sure water is available 24/7. Hungry chicks will eat and eat, but just a few hours without water will cause a life-threatening impacted crop. 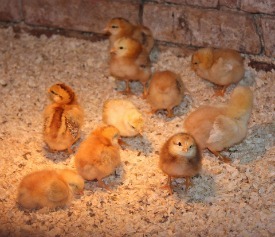 Be cautious when selecting a waterer for chicks. An open bowl, too deep, may lead to drowning. Raising chicks and ducklings together can make for a real mess. Ducklings use far more water than chicks and do better with a pan of water deep enough for swimming and kept fresh for drinking. Keeping ducklings and chicks in separate brooders is recommended. Supplying a constant source of fresh water for both is most important. A homemade chicken waterer can be made from a variety of materials. Many people have come up with very unique designs as varied as human creativity can be. If you have built a tried and tested homemade waterer we would appreciate you sharing it with us. You can upload your pictures by filling out the information below. When designing a recirculating water system some form of filtration is necessary to prevent clogging tubes and pumps and fouling the water supply. As chickens drink, feed in and on beaks will transfer to the water source. Organic materials like feed, shavings and droppings are the main source of water contamination. If left too long in the water they become a source of harmful bacteria levels. 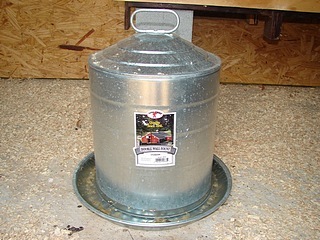 A winter chicken waterer, in cold climates presents many challenges. I prefer to retire my automatic plastic watering jug, after a good cleaning, and use 8 to 10” buckets. I remove the buckets after the chickens have gone to roost for the night when I suspect they’ll be frozen solid in the morning or have a thick frozen surface that prevents drinking. First thing in the morning I bring fresh filled buckets placing them where they will be warmest, either inside the coop or outside if the sun is shining. I’ve watched my chickens eating snow, but don’t rely on that alone to provide enough water to dissolve feed in their crops. Dry feeds and grains require plenty of water for good digestion. When it comes to the best chicken waterer for your flock, bigger is not necessarily better. It might seem like less work if the supply lasts a week or longer but in warm temperatures bacteria grows quickly. Most water containers that refill themselves provide no barrier from the tray to the storage source. Every passing hour that droppings and feed sit in the supply, results in increased bacteria levels. A healthy flock won’t be harmed by low levels, but waterers not cleaned out every day or so are not providing fresh water. Giving your chickens water that you would be willing to drink is a good test of quality. I know we watch our chickens drink muddy water from puddles and eat things we won’t, but good clean water sources makes for a healthier flock. Chicken waterers can be used to provide vitamins or medications to a flock, but the down side is that some diseases can be passed quickly through community waterers. Having a water source you are sure will last for days and a feed supply to match, can’t replace the value of spending a few minutes each day down at the chicken coop and yard. Counting beaks, making sure everyone is looking good, and seeing that food and water supplies are in good order is wise. Daily watching for any signs of weakness, illness or anything out of the ordinary will make it possible to deal with small problems now and then instead of huge problems that seem to sneak up on you. I have successfully used rabbit watering bottles with the stainless steel ball bearing tips for small groups of chickens of all ages. A chicken’s natural curiosity draws it right to the bottle and to pecking the shiny ball bearing. Once they locate a good source of fresh water they will return. The size of tip and bottle vary, so you can adjust this to the size of chickens you’re caring for. Just make sure the bottle is functioning properly. This and other “on demand” waterers will provide the freshest water without contamination, when kept clean.